Hello and thanks for stopping by! 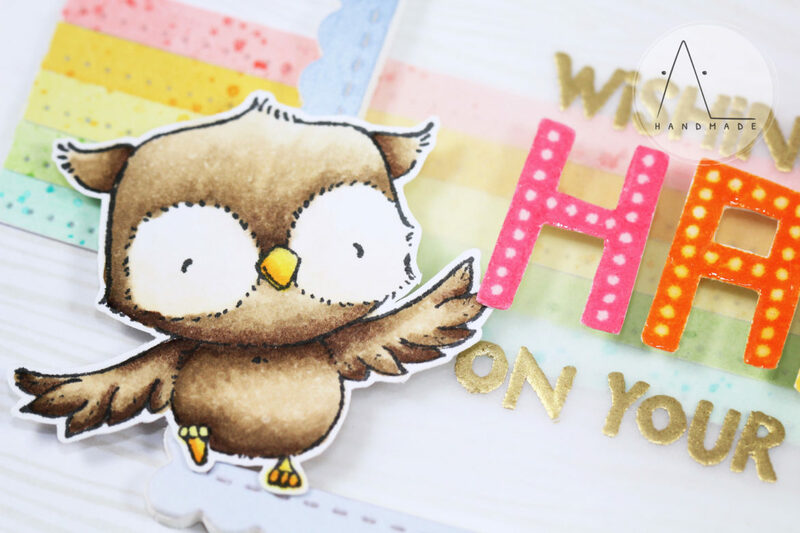 Today’s project features a cute owlet from Purple Onion Designs and a big, bold and glossy birthday wish. I stamped Lilly (Garden Owl) with Memento Tuxed Black ink and colored it with Copic markers. Next, as I wanted this card to be cheerful, I concentrate myself to the background, adding some colorful details on it. I stamped a woodgrain background on my card base with Altenew Evening Gray ink and added five colored stripes in the middle. To create the stripes, I ink blended some cardstock (with Abandoned Coral, Spiced Marmalade, Wild Honey, Moved Lawn and Cracked Pistachio Distress Ink) and die cut each color shade using Lawn Fawn Stitched Borders. [ Ciao a tutti e grazie per essere passati! Il progetto di oggi vede come protagonista una civettina di Purple Onion Designs accompagnata da un super sentiment glossy. Per cominciare, ho timbrato Lily (Garden Owl) con l’inchiostro Memento Tuxedo Black e l’ho colorata con i Copic markers. Successivamente, mi sono concentrata sullo sfondo e volendo rendere questo biglietto vivace e allegro ho aggiunto alcuni dettagli vivaci. 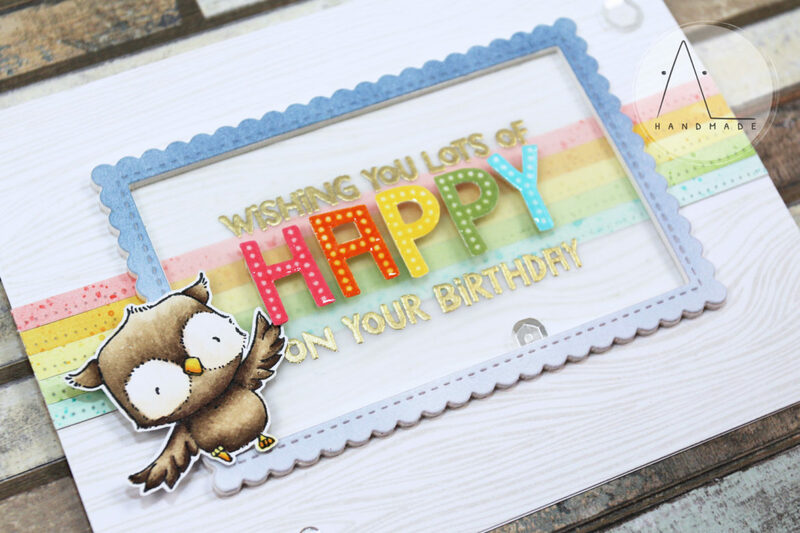 To complete my card, I chose the birthday wishes from Everyday Marquee Sentiment Set. I embossed part of it on vellum and stamped the rest of it with rainbow colors. I fussy cut the letters and covered them with Ranger Glossy Accents, as a final touch. I die cut a frame off ink blended cardstock (Faded Jeans Distress Ink), using Die-namics Stitched Rectangle Scallop Edge Frames from My Favorite Things, and used it to frame my sentiment. Finally, I foam mounted the frame on my cardbase and added my little funny owlet in front of it. [ Per completare il mio biglietto, ho scelto come sentiment un augurio di compleanno dal set Everyday Marquee Sentiment. Ho embossato parte del sentiment su dei ritagli di vellum e ho timbrato il resto con tinte arcobaleno. Una volta terminata la fase di stamping, ho ritagliato le lettere e le ho ricoperte di Ranger Glossy Accents, per un tocco luccicante! 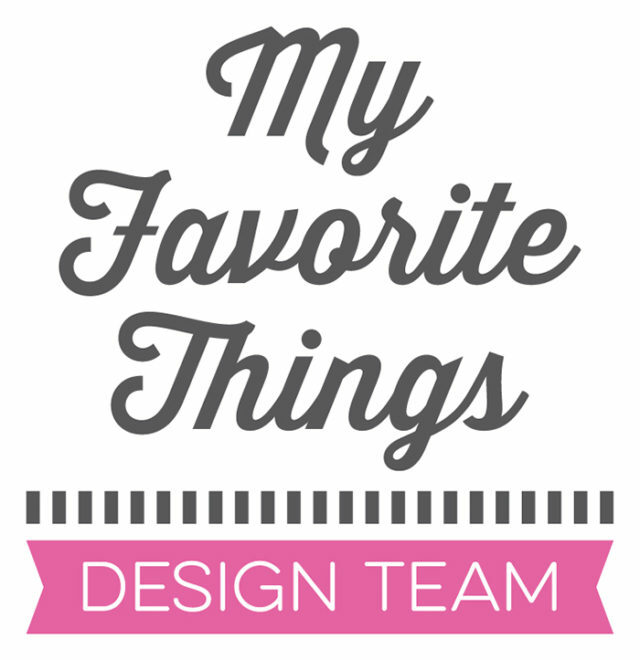 Ho fustellato una cornice da un foglio di cartoncino su cui avevo precedentemente sfumato dell’inchiostro Faded Jeans Distress Ink, utilizzando la fustella Die-namics Stitched Rectangle Scallop Edge Frames di My Favorite Things.